Now a days we all are suffering when our phone are giving problems and not working and we have to go to the service centres for repairing or servicing the phone. Sometimes service centres or repairing centres solved the problems quickly and sometimes they takes a couples of days to repairing the phone and in these cases we suffers a lot. We all knows that each and every phones has its own diagnostics features through which we can check some features or diagnose the basic problems of the phones. But most of the users didn't know about these features or about the various diagnostics tools which can held us to repair or solve some basic problems of the phones. Here in this article we are trying to give some ideas about these diagnostics tools or the features which can help the users to identify the problems in their phones and can repair easily and quickly. Troubleshoot of your Nokia device. Currently five diagnostics test are available but more tests are expecting soon. It also has the facility to provide suggestions for more tests on particular features. At present it supports only S60 5th editions devices but 3rd edition devices expecting soon. This application may be very useful when you do not have the internet settings in your current operator and through the application you can get the internet settings in your device. Just you have to select 'Internet Connectivity Test' and it will find the settings automatically to access the internet in your device. 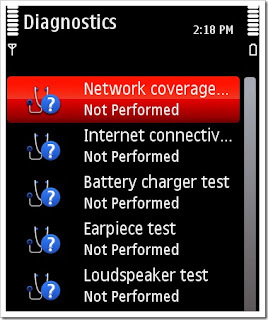 The other common mobile phone problems can be easily solved through the other diagnostics tests available in the application. The get the application you just have to download the same in your device and need to install and after that you can solved the common and basic problems of your S60 5th edition Nokia devices. We hope the above given information can help our users to resolve the common problems in their Nokia devices. If you get any problems during download and installation of the application kindly contact us and we will try to help you.